Make a run for the end zone. If you're a fan of football or free-running games, prepare to have your world shaken. 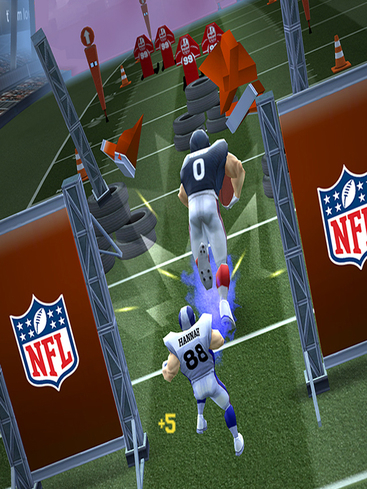 Pocket Gems announced that it partnered with the National Football League for a fun, free-to-play app called NFL Runner: Football Dash, which is now available for download on both iOS and Android. In the game, players will select their favorite NFL team and make their way up the field, avoiding both rival team members and obstacles while picking up a number of power-ups. The game also features a variety of collectibles. NFL Runner has a promotional tie-in with McDonald's. Starting September 23rd, when you purchase Mighty Wings or drinks from select locations, you'll earn codes you can use in the game to unlock additional power-ups, free-of-charge. "It's terrific to work with the NFL at the start of the football season to launch NFL Runner, which combines the fun of the endless runner genre with sports," said Ben Liu, CEO, Pocket Gems. "It has also been fantastic to work with McDonald's to create a promotional model that provides players with codes found on millions of physical products to unlock free power-ups in the game." "Pocket Gems has a strong track record as a successful developer and publisher of engaging mobile games and we're excited to work with them for NFL Runner," said David Healy, Director of Media Strategy for the NFL.Â "We're also thrilled to be working with McDonald's to bring millions of fans unique power-ups within the game.Â The collaboration between the NFL, Pocket Gems and McDonald's will make NFL Runner an innovative and fun new way for our fans to connect with their favorite team."